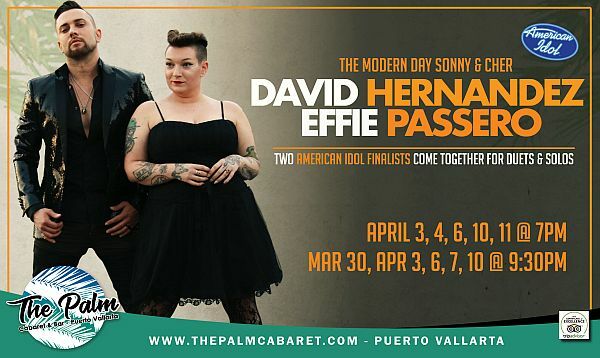 Puerto Vallarta, Mexico - With a little less than a week to go for our 2018-2019 season, NOW is the time to experience some of the best entertainment in Puerto Vallarta at The Palm Cabaret and Bar. April 11 will be our last day this season, but it's not over yet! As we head into the home stretch, you still have three more chances to see David Hernandez and Effie Passero. Both American Idol finalists, these two talented singers will be taking the stage on March 10 at 7:00 & 9:30 pm, and on March 11 at 7:00 pm. David Hernandez gained national attention with his powerful voice and affable personality as an American Idol finalist. He began acting and singing at age six, starring in musicals and performing with various theatre companies throughout Arizona. As a teenager, David began writing original music and recording his material. 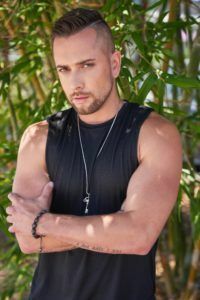 A Phoenix native, Hernandez recently moved to Hollywood where he is writing new songs, working in the recording studio producing his newest music, and pursuing his passion for acting. He has already completed his first feature film as the lead in the movie Synthetic Truth. In addition to American Idol, David has showcased his talents on The Ellen Show, The Today Show, MTV's TRL, EXTRA, Entertainment Tonight, Access Hollywood, Teen Choice Awards, TV Guides' Sexiest Stars 2008, Idol Tonight, Idol Gives Back and FOX-TV. A once-in-a-lifetime invitation came to David when he was asked to sing at the Inaugural Kick-Off Celebration ball for President Barack Obama. He was honored to share the stage with Jamie Foxx, John Legend & Maroon 5, along with event hosts, Jessica Alba, and legendary television producer, Norman Lear. Scottsdale, Arizona's most exclusive restaurant/show club, Barcelona, was David's performance home for nearly a year, performing three nights a week with his band Generation. Featured several times on FOX-TV, David's high energy stage presence and flawless vocal delivery kept the club packed every night. During the 2008 and 2009 holiday season, David travelled throughout the US, singing for over 250,000 fans, as the star of a twenty-four city tour entitled Idols at Christmas. Las Vegas was home for David over the July 4th weekend 2009, where he headlined three sold-out shows in the showroom at the South Point Casino in Las Vegas. Vegas called again when he was asked to be the featured performer in a major Las Vegas Casino's showroom for their 2010 New Year's Eve Show. David recently starred in the national & international tour of Ballroom With A Twist, which is a spinoff of TV's hit show Dancing with the Stars. It's directed and choreographed by Dancing with the Stars' own Louis van Amstel. This show was a non-stop music and dance extravaganza. And if that wasn't enough to keep David busy, he also performed in Motown Memories, Jersey Rocks and the Celebrate Motown tour. David just released his debut video (and single) for the song "Beautiful". The video was directed by Printz Board (producer of the Black Eyed Peas). He counts Stevie Wonder, Ne-yo, Donnie Hathaway, Alicia Keys, Luther Vandross, Michael Jackson and David Foster among his musical influences. Effie Passero is no stranger to the spotlight. Her musical career began when she was just five years old in Modesto, California, singing in local theatre. She also studied classical piano for 15 years. All through her years, Effie has been on stage in some way or another, whether it was a local production of a musical, a school talent show, or a piano concert. When she was 11 years old, Effie's life led her in an even more classical direction, studying opera for 12 years, and attending California State University Fullerton for Opera Theatre. She was dissatisfied with that direction, however, and began to take a heavier interest in writing music. Within her first year of college, she decided she wanted to pursue being a songwriter full time. With over 350 original songs under her belt, she is proud to say she has successfully honed in on her craft over the past 10 years. She now writes for TV networks, such as OWN, and also writes music for movie trailer catalogues for BMG and Universal Music. Her most recent adventure was ABC's first season of the American Idol revival. In 2018, Effie was a semi-finalist, placing in the top 20. The experience has led her to many wonderful opportunities and she is constantly grateful for everything that has happened since appearing on the show. 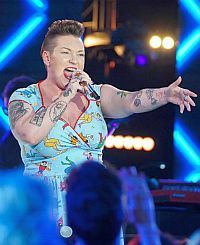 She was well known as "The Underdog" and was recognized and praised for her piercing vocals and wide range; even more so for her tattoos, hair, and dresses. Effie is currently working on her first solo album, expecting it to be out mid-April. When she is not writing, she works for a popular Youtube channel, called "Badanamu," singing children's music. David and Effie will be performing on March 10 at 7:00 & 9:30 pm and on March 11 at 7:00 pm. Get your tickets today at ThePalmCabaret.com. Open 7 nights a week, The Palm Cabaret and Bar features two shows per night, one at 7:00 pm and the other at 9:30 pm, through April 11, 2019. For more information and the 2018-2019 season's complete line-up, visit ThePalmCabaret.com. The Palm Cabaret and Bar is located at 508 Olas Altas in the heart of the Puerto Vallarta Romantic Zone. Tickets can be purchased at the venue's box office, which opens daily at 10 am, or online at ThePalmCabaret.com. For more information, click HERE, call (322) 222-0200, or follow The Palm Cabaret and Bar PVR on Facebook.